The VLCC skin defense range comes in a pack of two – a face wash and a scrub. 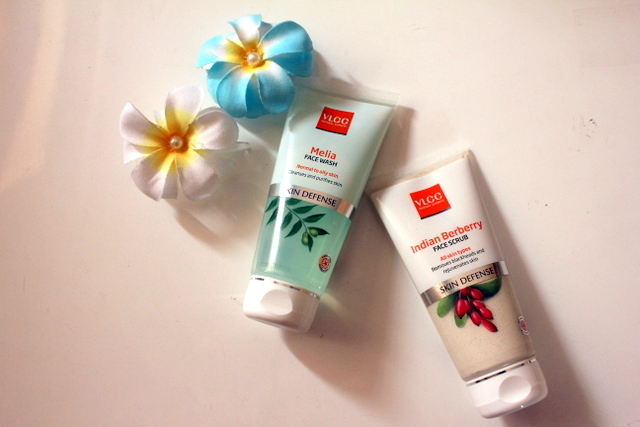 The Melia face wash comes in an 80ml tube and is priced at INR140. It is supposed to offer protection against pimples as well as control sebum secretion in your skin leaving your skin pure and sparkling fresh. It contains all the ingredients that are excellent for your skin like aloe vera, soap nut, honey, cucumber and orange peel. It has a lovely smell (which you know by now is one of the main things that I look for) not too strong and not too light either. It feels very pleasant and cool on the skin. It’s a nice face wash for oily skin and it worked pretty well for me when it came to combating the oiliness problem. It’s supposed to be used with the Lavang moisturizer (another VLCC product) but as usual I stick to my own moisturizer that I have been using over the years. Now the face scrub was something I was looking forward to using. I have a nice little collection now that’s easily going to last me another five months! The 80g tube is priced at INR220 and claims to exfoliate, cleanse and refresh the skin. You need to apply, leave it on the skin for a good 2-3 minutes and then scrub for another 3-4 minutes. I really loved this scrub! It has multani mitti, which you know is really good for skin. I’ve used multani mitti packs on my face for many years. It also has papaya extracts, banana extracts, walnut and Indian berberry among other ingredients. So the resultant smell is quite fruity! The scrub is grainy enough to exfoliate but not so much that it starts to burn your skin. My skin felt really soft and fresh to touch and the slight fragrance remained for a long time after! Among the two, I think the scrub is the clear winner! If you have used any of these, then let me know your thoughts!